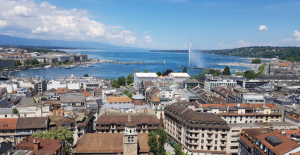 Together, with some 200 policymakers, experts, professors and teachers of Mathematics, Science, Technology & Engineering (also known as STEM subjects), Math Potentials co-founder, Dr. Sirotic, attended a global conference on “Mathematics for the 21st Century” in Geneva, Switzerland. The conference was hosted in the International School of Geneva, which is the oldest and largest operating international school in the world. It was at this school where many bold movements in education happened. For example, the concept of international education was born at this school back in 1924, and the prestigious International Baccalaureate Diploma Programme (IBDP) which is now taught in schools in over 140 countries was first established here in the mid-1960s. The presentations and discussions revolved around the all-important question: What should students be learning for the 21st century? This conference discussed top-level changes in the Mathematics school curriculum, regarding what branches and topics should be added or emphasized and why, and just as crucially, what should be de-emphasized or removed. The conference was organized in response to the acute need for better mathematics education everywhere. 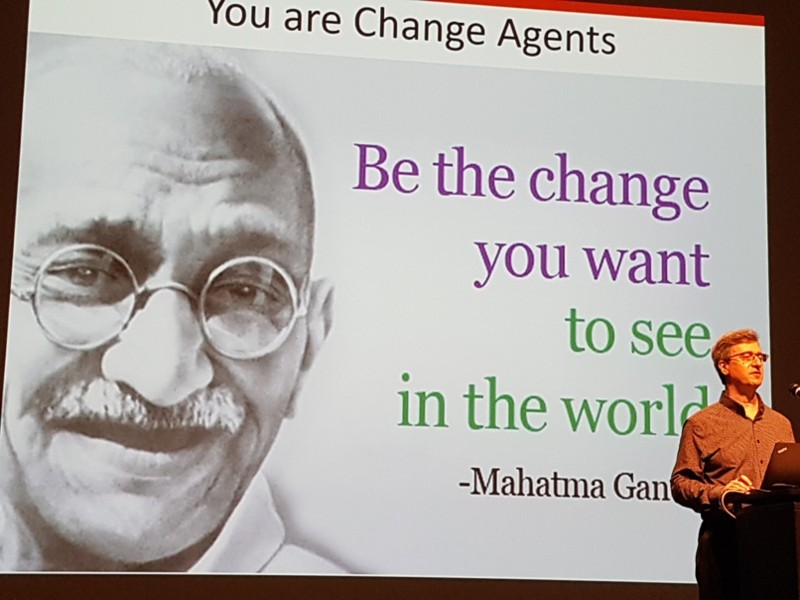 In the 21st century, humanity is facing severe difficulties at the societal (global warming, financial stresses), economic (globalization, innovation) and personal levels (employability, happiness). As the world of the 21st century bears little resemblance to that of the 19th century, many stakeholders recognize that education curricula are overdue for a major redesign. 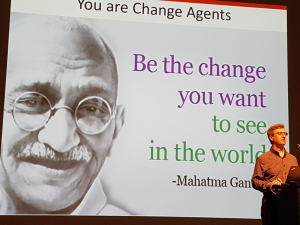 Charles Fadel, the author of the highly acclaimed book on educational transformation titled “Four-Dimensional Education” and founder of the “Fondation Helvetica Educatio”, the global educational foundation that organized this conference, opened the conference with the inspirational quote of Mahatma Gandhi, “Be the change you want to see in the world”. As young people of today are going to carry the great task of solving the problems of the future, their mathematical preparation is of huge importance. In Science/Technology/Engineering/Math (STEM), demand is outpacing supply worldwide. Math being the foundation of STEM, and in turn innovation, the situation requires urgent attention. Beyond STEM professions, many countries, including Canada, are seeing very significant innumeracy in a very large segment of the population, which has severe consequences on the ability to understand the world’s difficulties and solve problems that lie ahead. The conference featured deep, relevant and exciting topics. For example, the speakers addressed the question of what will be the nature of the jobs of the future and what fields of study will be in demand. Data Science, Artificial Intelligence, Machine Learning, Cryptography will all be in demand and will require sophisticated mathematical skills. Several presenters addressed the need to teach mathematical thinking and reasoning as opposed to mere computational skills which now calculators and computers can do for us, and which many students in various schools learn to do by memorizing procedures rather than actually understanding why and how the standard computational algorithms actually work. One of the speakers, professor Keith Devlin from Stanford University, spoke about mathematics people really need. He used the following mathematical problem to illustrate his point. The problem is interesting because it appears to be so simple and yet a very large proportion of people solve it incorrectly. 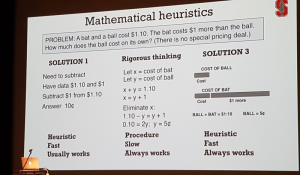 Professor Devlin thinks that people need to be taught heuristics that make their thinking strategic, reliable and commonsensical. 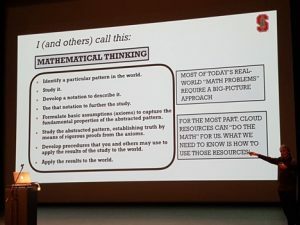 All too often they use naïve guesswork (illustrated in SOLUTION 1 on the slide below) or algebraic procedures which can be slow and cumbersome, and are not accessible to young learners who have not yet learned algebra (illustrated in the middle part of the slide). Notice that SOLUTION 3 is the kind of mathematics that a young student can use to reason his or her way through this problem. It is considered the most efficient, meaningful and reliable. This is precisely the kind of mathematical thinking and reasoning that is promoted by the Singapore Math Program and its problem-based curriculum which our students are enjoying from the very start of their experience at Math Circles, in the Alpha and Beta levels. This reaffirms that Math Potentials students are on good path to becoming numerate citizens who will be prepared for the challenges of the 21st Century. Conrad Wolfram, the founder of Mathematica (most sophisticated software for doing mathematics, used by mathematicians, engineers, and scientists) and the Internet-based computational knowledge engine Wolfram Alpha (which can answer any school math question in an instant and show the entire derivation process too) presented his talk titled “Stop Teaching Calculating, Start Teaching Maths”, urging curriculum developers and ministries of education across the globe to not confuse math with calculation, but see it for what it really is and for what it can do for humanity if we were to educate students properly in this important subject, and truly prepare them to be equipped with knowledge and skills needed for the 21st century. Galileo wasn’t the only one to have a deep reverence for math. Modern theorists believe mathematics is humanity’s greatest invention, a system of patterns, logic and abstract symbols that describe, predict and bring elegant order to the world around us. Math may come last in the STEM acronym, but it forms the underlying basis of the three other disciplines. If STEM were represented as a pyramid, mathematics would be its foundation. This is why it is so important that children learn and love mathematics from their early age and then sustain this learning well into the university years and beyond.